In 2013 Chef Tyler Florence added a new pearl to his strand of fabulous eateries in California‘s Bay Area. The retro Wayfare Tavern, tucked away under the shadow of the Transamerica building, is almost hidden from sight on the corner of Sacramento and a tiny alley called Leidesdorff. It is the perfect bar to warm your spirit with a bit of chatter, a lot of cheer, some warm-your-bones terrific food. Come to this spot to indulge in the pleasure of being hidden away just long enough to disappear into an evening of nothing but hearty delights. To approach Wayfare Tavern on a darkened evening is to feel the thrill of an old-time speakeasy, the discovery of a warm and bustling pub when you’re longingly searching for a haven and you’ve come up short. And then, you turn, and you see it, shining through its windows: Dark wood, inviting amber lighting, a long counter and a steep staircase, and it beckons you inside. The interior of this venue is all groove and cool: smooth lines, burnished wood paneling, 1940s floor tiles with a broad and long counter running the length of the ground level. The place is long and narrow, and there is cozy seating upstairs as well. Check your coat—no need to go incognito anymore—and reveal your need for sustenance (cocktail first) in the vivacity of a truly humming eatery. That’s what you’ll find at Wayfare. On any given night it’s loud, it’s alive, and it’s buzzing with the conversation of souls just like you, who have come in from the San Francisco chill to find a euphony of chatter and delicious food. There is no better way to spend an evening in the financial district than to explore the area’s architecture, catch a flick at the Embarcadero—and then belly up to the bar for some oysters and a plate of Florence’s fried chicken. 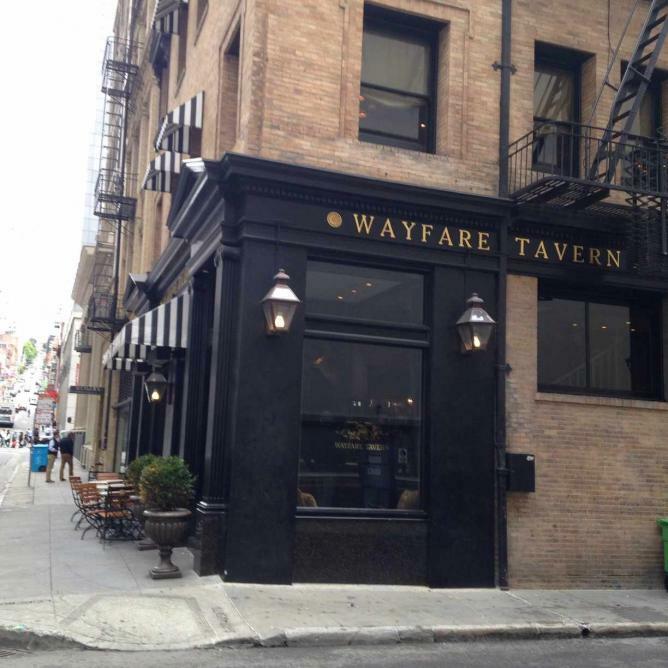 Wayfare Tavern has a tendency to get swirlingly loud. Don’t be surprised to find a boisterous group of women on a bridal-party night out, and groups of let’s-get-loose parties—but the waiters are trained to mitigate the madness by guiding customers to some lovely wines, and striking up knowledgeable conversation about the history of the place and the mix of exquisite tastes they are serving. 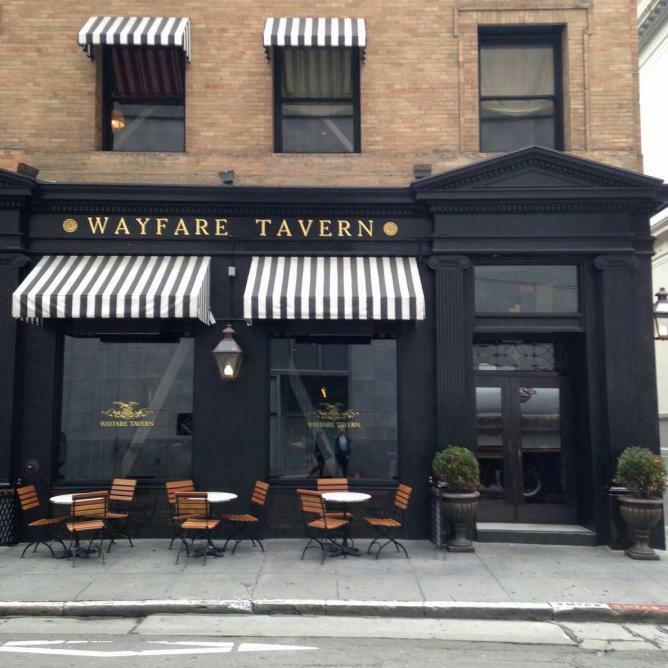 Wayfare tavern is upscale pub food—meaning, the menu is not vast, but each item is well-chosen on a blow-your-mind scale of comfort-food delights. Fried chicken ($25) and halibut ($31) are the main-mains; pork belly “pork n’ beans” ($27), homemade tagliatelle ($19), and a gourmet burger ($20) round out the entrees. Side dishes are all $9 (no sides are included with entrees), and the baked macaroni and cheese is a knockout. The creamed Bloomsdale spinach is a revelation in your mouth—cooked by pureeing part of the dish with heavy cream, then sautéing whole spinach leaves into the mix. The effect is melt-in-your-mouth divine. The caramelized mushrooms and Burrata-whipped potatoes are also lovely. The raw bar is always serving something delectable, and the oysters are small, fresh and perfect. The place is very popular so best to make a reservation, particularly if you’re a party of four or more. Pricing is on the expensive side, even for gourmet pub food—drinks, too—but the portions are ample enough so you can feel free to share a plate of fried chicken and a couple of sides, grab a cocktail and make a night of it. JoAnneh Nagler writes travel, books, plays, essays and music, and is the author of the new book How to Be an Artist Without Losing Your Mind, Your Shirt, or Your Creative Compass (2016), and the Amazon Top-100 book, The Debt-Free Spending Plan. Find her at: www.AnArtistryLife.com.